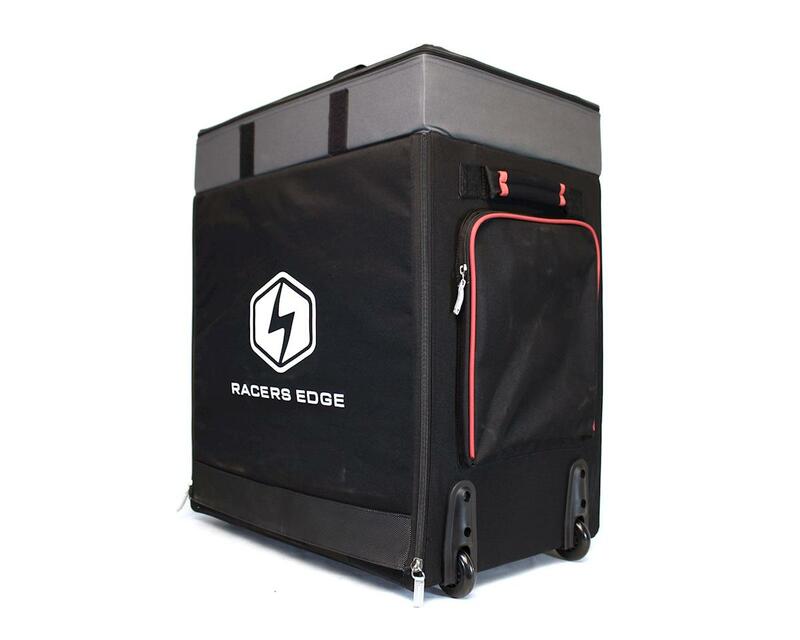 This is the Racers Edge "Silver Edition" 1/8 Scale Car Hauler Bag. This top of the line R/C hauler bag will work great with 1/8th scale buggies and smaller scale R/C cars. It features 2 small drawers in the lowest position, 1 medium size drawer in the middle position, and 1 large drawer in the upper position that is large enough for a 1/8 scale buggy with the wing and wheels attached! The drawers are all black corrugated plastic, so they will stand up to lots of abuse, will not absorb oils or fuel like cheaper cardboard drawers, and are easily washable. It also features smooth rolling wheels, an advanced telescoping aluminum handle and a upper compartment with an elastic loop tool holder with spaces for 12 tools and room for smaller individual boxes (not included), to hold more tools or spare parts. On the outer portion of the bag are multiple pockets for storage; the left side has 2 large pockets, the right side has a single large pocket and the rear has a large pocket big enough for a setup board! Overall Bag Outer Dimensions: 13½x20½x23"
Over all a good design for usability and convenience. I just don't like the placement of the top carry handle, it puts the whole weight of the bag on the zipper of top tool compartment if you choose to use the top strap handles, like in/out of your car. I kinda also think its over priced like any other hauler available. The Pro-line one is only $140 but they don't have the nice big tool compartment on top. One of reason I wanted to get a hauler is to be able to put everything in one bag except the transmitter. I would prefer the whole package to be more heavy duty for the price but there's really no better systems out there. I was actually reluctant to pay $180 for this but can't find a better way to carry all my stuff in one package. Oh one other thing I like about the design is its very low key and clean looking. No flashy colors, no big lettering or brand names that says something about racing etc. Its just a black cloth box with silver lining and a small Racer's Edge logo in the corner. I would say its fair value consumer price is about $110.. If a Samsonite premium polycarbonate hard shell luggage is at $140, this hauler's price shouldn't surpass that.